As more and more people are opting to live off the grid and become more environmentally cautious, the idea of living in a tiny home becomes more appealing… to some. The trend is more popular with those trying to downsize after their children have grown and also with millennials who have just graduated from college and are looking to reduce their carbon footprint and save money at the same time. Before we go over the Pros and Cons of Buying a Tiny Home, let’s determine what a tiny home actually is. The size of a tiny home is usually between 100 and 400 square feet, and nearly always under 500 square feet. 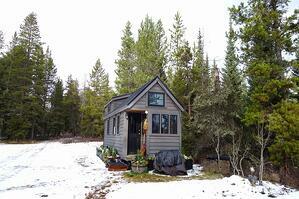 There are multiple ways to establish a tiny home. They can be built on site (depending on zoning laws in your area) or a kit can be built to your specification and shipped to your location for you to set up. They can also be built with a trailer hitch so you can move around with your home. Though this option might sound great, zoning laws may prevent you from establishing your “home” in certain locations. This will be touched upon a bit more below. Affordability: Not only do they cost less to build, but they also cost less to maintain. Heating, air conditioning and repairs are all things you will be saving on monthly. With much less space to heat/cool, you can use a single woodstove in the winter and one air conditioning unit in the summer. If building a custom home and living off the grid, you can have solar installed so as not to have to worry about a utility bill. Composting is often used for bathroom needs and well water and natural springs are often used when available. Helping the Environment: The construction of a tiny home uses substantially less materials than building a regular home, and it utilizes much less power to do so. Since you are saving money on the actual building due to the smaller size, you might be able to spend a little more on the needed supplies and buy eco-friendly products. Mobility: Whether you need to travel for work or just want to see the country, having a tiny home allows for greater mobility. They are able to fit on flatbed or can be hooked up to a trailer hitch when the time comes to pack and move. Space, or lack of space, for storage and living: The lack of space is a huge issue for many. Though having a small area means less cleaning, it also means less storage, which could lead to more clutter. In addition, there is not extra room to work or to entertain guests. The lack of extra room also means it is not ideal for those looking to start a family. Financing: Being approved for loan to build a tiny home is much more difficult that one might think. Financial institutions do not consider a tiny home to carry enough value to risk this type of loan, therefore many people have to rely on personal loans or credit cards for financing instead of a mortgage. Zoning: As mentioned briefly above, zoning laws may prevent you from building a tiny home in your desired location. Zoning laws dictate a minimum amount of space in order to allow the building of any structure, and tiny homes do not qualify in many areas. These laws differ from state to state and county to county, so be sure to do your research where you would like to build before making any plans or spending any money. While the home itself you may be considering is tiny, it is a very big decision you are making. Weigh the pros and cons and continue your research before moving forward. Though the Pros might make it appear to be a no-brainer for you, take the time to really consider and research the Cons since some of the issues mentioned above might be out of your control.